You would be amazed by the knowledge and education Angela Kirk has gained in 15 years as a cosmetologist. 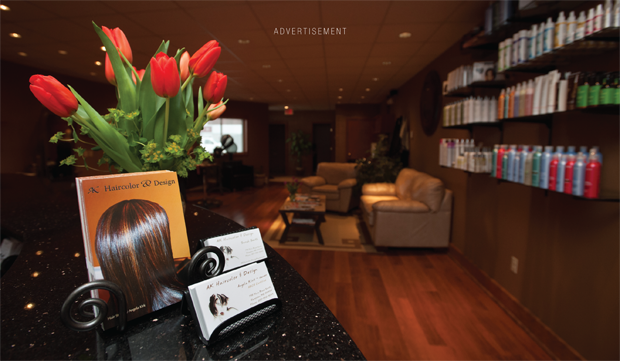 She earned her certification with the American Board of Certified Haircolorists (ABCH). She is the owner operator of AK Haircolor and Design. Angela has taught haircoloring classes in Boston, New York, and Los Angeles. She’s worked with world-renowned master haircolorist Dwayne Ross whose clients include such celebrities like Jennifer Lopez, Rod Stewart, Carmen Electra, Ashlee Simpson, Jessica Simpson, and more. Additionally, she has taken classes with Anthony Morrison (the winner of Bravo’s reality show Shear Genius). Now is the perfect time to make people sit up and take notice of your beautiful new style.